While I was browsing on Facebook several months ago, I stumbled across a post that mentioned a blog hop that was themed around using countries as inspiration for creating jewelry. 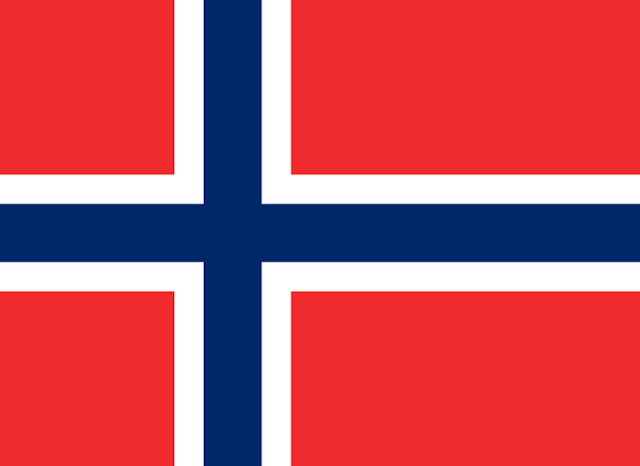 I knew I had to choose Norway as my inspiration, in part because it is a beautiful country but also because it is part of my heritage. My grandfather was the first Anderson born in the United States (well, our family of Andersons at least). Harry and Matilda had two daughters, Emma and Marie, who were born in Norway. After coming to America, Matilda became pregnant 12 years after Marie was born and gave birth to Henry. Fishing is a staple in Norway and my Poppop was true to his roots. He was working at the oyster docks from the time he was eight years old and fished up until his death at 80. 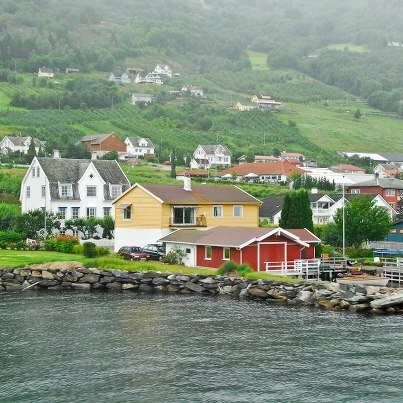 This picture is of a coastal town in Norway, via Facebook (Attracting Places). The coast of Norway provides a great place to fish. The most common fish include cod, coalfish, pollack, halibut, catfish, shark, flounder and mackerel. Poppop loved to fry fresh flounder that he caught in the Deleware Bay, off the Atlantic Ocean. If you've every watched "Deadliest Catch," you are no doubt familiar with the fishing vessel The Northwestern and it's captain and deckboss, Sig and Edgar Hansen. Their practical and pragmatic temperment is classic Norwegian. There was not a problem Poppop couldn't solve with just a few tools and some old-fashioned ingenuity. 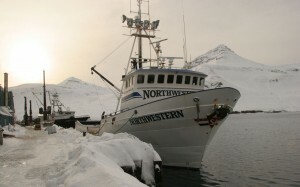 Official photo of the Northwestern in Dutch Harbor, Alaska. I think I get my love of snow and winter from my Norwegian heritage. I get as excited seeing the first snowflakes falling now as I did when I was a child. I love to visit old churches and if I ever was able to travel to Norway, I would definitely visit the Nidaros Cathedral as well as some of the local chapels. 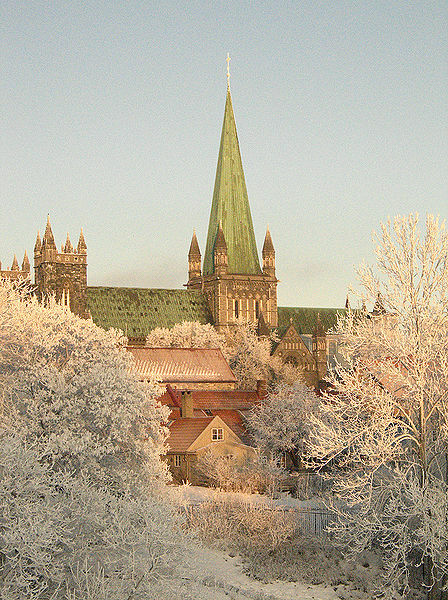 Nidaros Cathedral, the largest church in Norway. 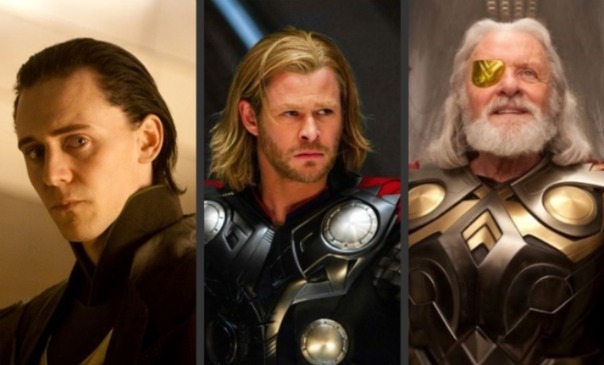 While Norse mythology is not as well known as Greek or Roman mythology, it is certainly worth getting to know Odin, Thor and Loki. The scenery is something that photographers are always traveling to Norway to capture. I think I would love to live in this house! Do you feel inspired by the beauty of Norway? I certainly was! I created three pieces of jewelry for this challenge...I really wanted to teach myself a netting stitch that would resemble a fishing net, but it has taken a little longer than I expected. But I will figure it out and share it when it is completed. The first piece was a brand new stitch for me, a helix stitch. 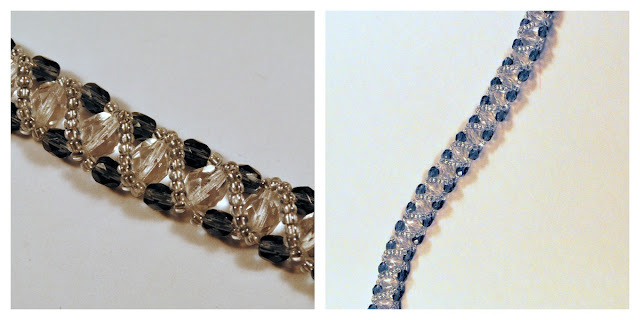 I'm working with a new light box and was able to capture the changing color of these amazing czech glass beads. This was a really fun design and I can't wait to try it with different types of beads! My aunt decorates her Christmas tree with traditional Norwegian red and gold ornaments. 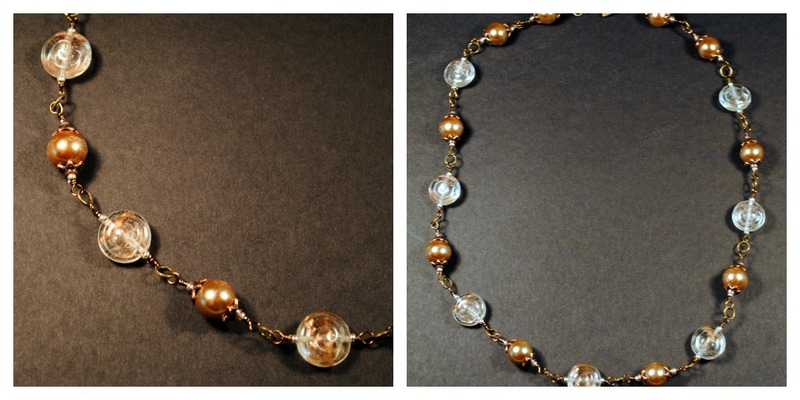 I looked through my stash and found some gold glass pearls that were the basis of this necklace. I haven't made a wire wrapped necklace in a while, so this was a lot of fun to design! The round clear glass beads have a spiral ridge detail that adds to the visual interest of this piece. I used antique bronze wire and antique copper bead caps to complete the monochromatic color palette. My final piece of jewelry was inspired by the amazing photo of a person sitting on a ledge with all the shades of blue below. 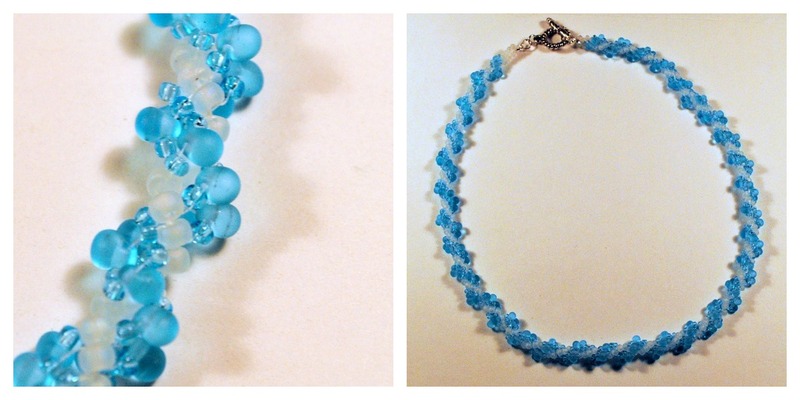 I used matte aqua blue drop beads and matte white glass seed beads, highlighted with transparent aqua seed beads. The different shades and textures created a stunning necklace. I have to find the perfect piece of white sea glass in my stash to create a pendant to go with it. Be sure to take a walk around the world and view the other creations inspired by the countries of the world. That first bracelet is exquisite. Beautiful contry, beautiful photos. 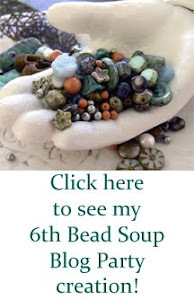 As always - I am impressed with seed beads and bead weavings! Such intricate work! But I would be remiss if - in a post linking Norway to jewelry - if I didnt mention the Goddess Freyja and her necklace Brisingamen. There is a very dramatic tale of how she earned and lost it. Also - amber is called "Freyja's tears" as myth said she cried tears of gold. Nice job! I love all your pieces, but the aqua blue is gorgeous. great job. Those are all beautiful. I love your helix stitch. I haven't tried that one, but I am inspired to give it a go. I am taken with the middle one, the pearls and those beads are amazing together. 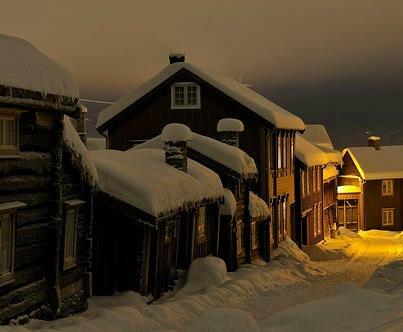 Okay, now I need to go to Norway, too! BEAUTIFUL pictures - the one with the person sitting on the edge of the rock overseeing the stunning topography took my breath away! Your last necklace - the blues - is absolutely beautiful and I would wear it AS IS - it needs no focal! Simply beautiful! Beautiful pieces...I love the way you created such different pieces but each captures something beautiful about Norway. I am always in awe of the weaving techniques...I've tried but all that really happens is frustration (translate cursing)...you do it beautifully! Lovely pieces, and I loved hearing about the things that inspired you for each one. You really captured your inspirations! You certainly found amazing photos of Norway. 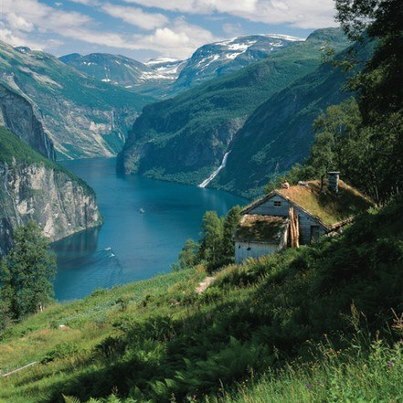 I have to admit, that as much as I love snow and winter, I've never considered Norway as a place I would love to travel and visit. Your photos have got me thinking differently. What an awesome place! 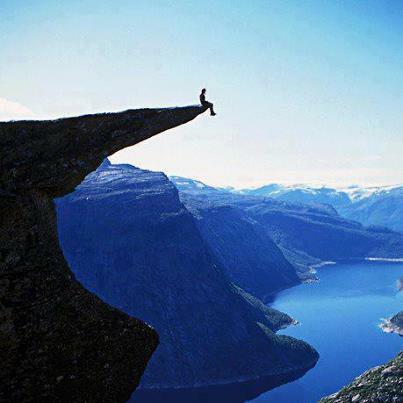 And that photo of the man sitting on that ledge...years ago, I had a dream that was so real I never forgot it. I was standing on a ledge just like that one, looking out over water...the angle was different, but it looked like the same place. I was watching for a ship and wearing a long white fur cape. A little blonde girl was with me, holding my hand. It's the weirdest thing. Anyhow, I do love your pieces. Each evokes a different emotion, a different sense of the place. A very interesting post. The photos you shared have made me want to go to this wonderful place! I'm always impressed with beadweaving, something I don't think I would have the patiene for. Your pieces are beautiful and I love the inspiration behind each one. Cindy, what wonderful photos you have chosen, showing Norway in all its amazing variety. 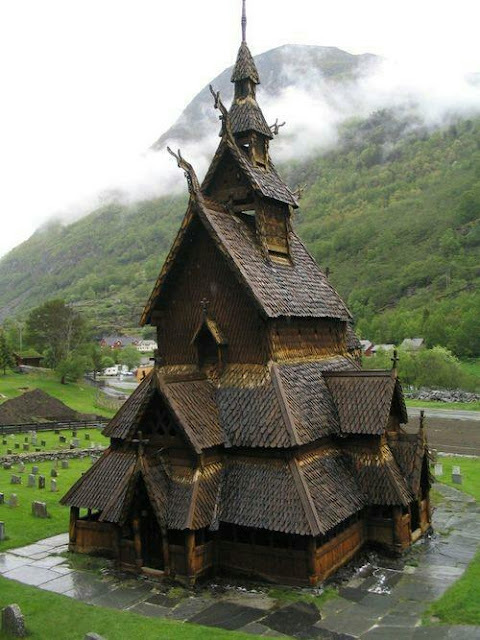 Of course they are famous for those fiords, but I had never seen those church photos. My favourite is that improbable chapel that looks as if it will fall over at any time! Bravo for trying new stitches as part of your challenge! We should all be that daring, Cindy. I love that you have kept the designs clean and uncluttered. Beautiful pieces! Wow did you ever find some stunning visuals as inspiration. I could almost live in that house but I would bet that grass is only green a handful of days a year. I'm not a snow girl like you! Very pretty creations you came up with. I've never seen that helix stich before but I think I will have to learn it for some 7000 bracelet donations I have in mind. Thanks for that! Cindy, thank you so much for taking us on this stunning photo-tour of Norway! The images you've chosen for this journey are amazing. And I love all of your pieces that you've created, but that first piece with the helix stitch is gorgeous! I never even imagined the scenery in Norway and it is incredible. I always just pictured a place constantly covered in snow so thank you for clearing up that misconception. Your jewelry is beautiful especially that first bracelet. 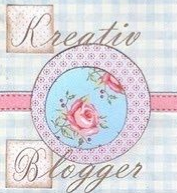 Beautiful pieces,and beautiful blog post!